I was rather excited to receive my delivery of the new glass from Double Helix called Notos. When I opened the package, I must admit that at first I was slightly disappointed at the pale blue-grey shade of the glass. It didn’t excite me one bit. Anyhow, I though it best to give the glass the benefit of the doubt and made some spacer beads. 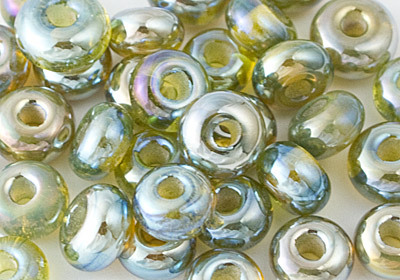 To be quite honest, I wasn’t sure how to describe the finished beads as they have a blue-grey base with a golden metallic finish. You would think that with the colour combination that the beads would look green, but they don’t. I’ve spent time playing with this glass and found that it behaves fairly similarly to triton when reduced and encased in clear – although a bit paler in the blue shades. However, I prefer it as a surface decoration as it’s quite interesting with the two tone colour effect that it seems to have. Double Helix seem to select unusual names for their glass, so I decided to look it up. Notos appears to mean Greek wind gods according to Wikipedia. I can’t make a link, but perhaps you can? This is the latest batch of spacer beads that I’ve made – you can see the two tone colour combination as well as the odd bit of pink that appeared after reducing the surface to it’s shimmery colours. I love Double Helix’s Notos glass now!